"Most of all, a man tends to imitate himself. The fact that he has done a thing once, in a certain way, makes it easier for him to do it again in the same way. The oftener this is repeated, the more fixed does the habit become. At last he cannot do the thing in a different way without great effort. Finally it may become almost impossible for him to do it in a different way." From our life experiences, we all know the importance of practice in order to get better at something. Consider something you do well: a sport, an activity, a skill. How did you learn to do it? How did you get better at it, or master it? There is an old saying we are all familiar with: Practice makes perfect. In the classroom, students must practice the skills we are teaching for it to become internalized. As Everett pointed out in 1891, students need to practice something for it to become habit. It is important for us as educators, then, to not only provide opportunities for students to practice, but to practice correctly. As some have pointed out, perfect practice makes perfect. This is not to say that we cannot allow students to make mistakes. Errors and mistakes are an integral part of the learning process. Through practice with feedback, students learn to correct errors or mistakes and master a skill or concept. Players of any given sport play practice games, tournaments or races, and the coach provides feedback to participants. So must teachers provide opportunities for students to practice a skill and provide targeted feedback to students so that they can progress. Madeline Hunter spoke of the importance of guided practice in the 1980s. It has since been entrenched in lesson plans and discussions about teaching. We know that practice builds fluency; in order for students to learn to read or write, they must participate in the act of reading and writing. Reading and writing must be incorporated often in each of the content areas we are teaching so that students can learn about the topic and express their thinking. Similarly, by adding student discourse, we help students to solidify their thinking, gain ideas and thoughts from others and become more articulate. What does guided practice look like in the classroom? Many teachers are familiar with the phrase "I do, we do, you do," or the gradual release of responsibility. The idea here is that the learning and cognitive load should be shifted to students over time through teacher modeling, collaborative practice and individual application. The release can occur over a short time frame, such as within a class period, or over longer periods of time, depending on the complexity of the skill or concept. At times, however, we see an instant release of responsibility, wherein students are immediately asked to apply a skill or concept independently, sometimes after little or no modeling. Consider the following scenario, all too common in classrooms today: The teacher asks the students to read specific pages in the textbook and take notes on what they are reading. The teacher might point out to students that it is important to pay attention to the headings, bolded words, graphics, italicized portions of the text, etc. After they have read and taken notes, the students then are asked to answer questions based on the reading, referring back to their notes. 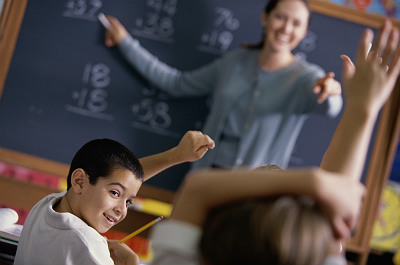 The teacher instructs the students that they can either answer the questions independently or in small groups. This scenario provides little to no practice for students before moving to independent practice. The teacher will not necessarily be able to determine areas of misunderstanding or needed additional instruction until students have turned in the work. Even when teachers are cognizant of the gradual release and begin to implement it in their lessons, we often see a dominance of teacher-student interactions. For example, the teacher may model solving a math problem, using a whiteboard, interactive whiteboard, overhead or document camera. From there, the teacher guides the students through a discussion, potentially calling on students to share what the next step is, or having individual students come to the front of the room to help work through the problem. The teacher then has the students independently practice by solving a series of problems that involve the skills and concepts being taught. These interactions, however, miss a critical learning component: learning through collaboration with peers. Consider, then, a slight change in the phrase "I do, we do, you do" to "I do, we do together, you do together, you do independently." The amount of time for each of these phases of the gradual release will vary, and teachers need to consider both long-term and short-term implementation. Modeling, guided practice, collaborative practice and independent practice may be done within one class period, and may also last over a longer time span in order to help students master a more complex skill. For example, math expert Terry Wardlow recommends the following sequence in a math lesson: the lesson starts off with four different examples done by the teacher of the same type problem with teacher talk. Here the teacher is modeling and sharing her thinking about how the problem is being solved. From there, the "we do" is similar but includes students coming to the board to write the next step or steps. The teacher might have three or four kids to the board on one problem, or she may call on students to tell you what to do next and why. This is done for two or three problems so multiple students have the opportunity to work through the problem with teacher guidance. The following step would be to have students work collaboratively, in pairs, triads or potentially groups of up to four students do three or four problems. Lastly, students would be assigned a few problems to do on their own to practice and/or demonstrate mastery of the skills. All of the problems would need to be similar in terms of the skills being practiced. In this portion of the lesson, be explicit with students as to how to use a particular skill you are teaching or understand the concept being taught. Include think-alouds as a way to explicitly share with students what goes on in the mind of a proficient reader, writer, mathematician or professional in the discipline you are teaching. Provide scaffolds for students by clearly explaining tasks and lead students step-by-step through the processes they will be using. Additionally, consider including color-coding as a scaffold, by changing the color of the pen you are using during each step. For example, if solving a multiple-step math problem, switch colors when you go to the next step so that each step is clearly marked for students and you can discuss clearly each step with them. It is important to point out that students should still be actively engaged during the modeling process. Teachers can have students chorally call key vocabulary or next steps, discuss predictions or ideas with a partner, or write down a quick summary of what has been done so far before moving on. As you move toward practicing with students, consider how you will call on students. Begin with selecting some students intentionally. These may be students who have a clear understanding of the step you are practicing, or students that have a common misconception that needs to be addressed with the class. Next move to calling on students randomly. This can be done using a cooperative structure like numbered heads, or through other methods such as using a computer program. Calling on random students holds all students to be accountable to work through the skill and demonstrate where they are in the process. Successes or errors can be addressed at this time. Finally, call on volunteers. At times the students who always volunteer to share or practice will have something additional to add that has not come up with other students. This practice flips what we often see in classrooms, where teachers first call on volunteers. The problem there is that often the same group of students gets called on time and again, and leave other students disengaged or lacking an opportunity to practice with direct guidance from the teacher. Of course, the students who are helping you or sharing ideas should not be the only students engaged in the instruction. Just as in the modeling section, other students can stay engaged by chorally calling out vocabulary or steps, helping the student through "phone-a-friend" or by assisting each other, writing down information, making predictions, discussing with partners, etc. During the interactive peer-collaboration guided-practice phase, students work together in small groups to practice the skill or concept. Teachers can incorporate cooperative learning structures at this point to maximize student participation and practice of the skills or concepts. Having students seated in pairs, triads or small groups will be helpful during this time, and structures such as having a talking stick and explicit roles within a group can keep students on task and provide an opportunity for all students to be equally involved. The teacher, during this time, walks around monitoring student practice and assisting students as needed to clarify any misconceptions. The teacher can remind students of key points, and assesses if particular students or if the entire class needs additional instruction. During this peer collaboration time, teachers can also pull together a small group of student that may need additional modeling or instruction, thereby differentiating for students based on need. The last stage requires students to practice and apply the task independently. In many ways this can be said to be the purpose of education: to have students be able to apply the skills and information they have learned on their own, without the help and support of a teacher or peer. There are multiple ways that teachers have implemented and continue to implement independent practice and application in the classroom. Students do projects, keep portfolios, do homework and do in-class practice each day in classrooms around the world.